The findings are published in the most recent issue of Nature Communications. About 4.6 billion years ago, a cloud of gas and dust that eventually formed our solar system was disturbed. The ensuing gravitational collapse formed the proto-Sun with a surrounding disc where the planets were born. A supernova—a star exploding at the end of its life-cycle—would have enough energy to compress such a gas cloud. Yet there was no conclusive evidence to support this theory. In addition, the nature of the triggering supernova remained elusive. Qian and his collaborators decided to focus on short-lived nuclei present in the early solar system. Due to their short lifetimes, these nuclei could only have come from the triggering supernova. Their abundances in the early solar system have been inferred from their decay products in meteorites. As the debris from the formation of the solar system, meteorites are comparable to the leftover bricks and mortar in a construction site. They tell us what the solar system is made of and in particular, what short-lived nuclei the triggering supernova provided. "This is the forensic evidence we need to help us explain how the solar system was formed," Qian said. "It points to a low-mass supernova as the trigger." Qian is an expert on the formation of nuclei in supernovae. His previous research has focused on the various mechanisms by which this occurs in supernovae of different masses. His team includes the lead author of the paper, Projjwal Banerjee, who is a former Ph.D. student and postdoctoral research associate, and longtime collaborators Alexander Heger of Monash University, Australia, and Wick Haxton of the University of California, Berkeley. Qian and Banerjee realized that previous efforts in studying the formation of the solar system were focused on a high-mass supernova trigger, which would have left behind a set of nuclear fingerprints that are not present in the meteoric record. Qian and his collaborators decided to test whether a low-mass supernova, about 12 times heavier than our sun, could explain the meteoritic record. They began their research by examining Beryllium-10, a short-lived nucleus that has 4 protons (hence the fourth element in the periodic table) and 6 neutrons, weighing 10 mass units. This nucleus is widely distributed in meteorites. In fact the ubiquity of Beryllium-10 was something of a mystery in and of itself. Many researchers had theorized that spallation—a process where high-energy particles strip away protons or neutrons from a nucleus to form new nuclei—by cosmic rays was responsible for the Beryllium-10 found in meteorites. Qian said that this hypothesis involves many uncertain inputs and presumes that Beryllium-10 cannot be made in supernovae. Using new models of supernovae, Qian and his collaborators have shown that Beryllium-10 can be produced by neutrino spallation in supernovae of both low and high masses. However, only a low-mass supernova triggering the formation of the solar system is consistent with the overall meteoritic record. "The findings in this paper have opened up a whole new direction in our research," Qian said. 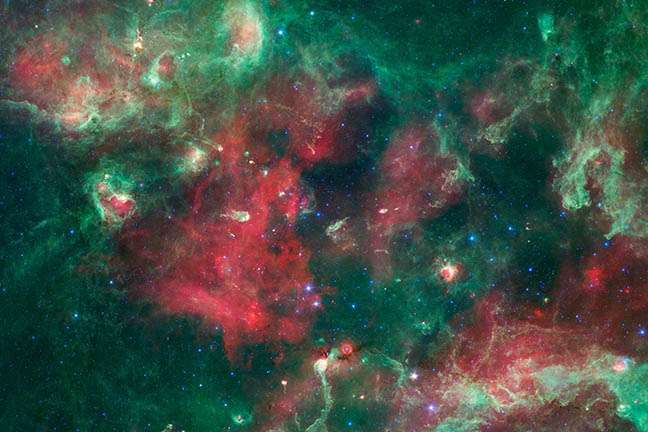 "In addition to explaining the abundance of Beryllium-10, this low-mass supernova model would also explain the short-lived nuclei Calcium-41, Palladium-107, and a few others found in meteorites. What it cannot explain must then be attributed to other sources that require detailed study." Qian said the group would like to examine the remaining mysteries surrounding short-lived nuclei found in meteorites. The first step, however is to further corroborate their theory by looking at Lithium-7 and Boron-11 that are produced along with Beryllium-10 by neutrino spallation in supernovae. Qian said they may examine this in a future paper and urged researchers studying meteorites look at the correlations among these three nuclei with precise measurements. "Whole article (this and the original)"
This is a wonderful example of the inseparability Sciences of magic. The Milky Way has 1,000 or several thousand supernovae and novae. And behold, miracles, they created 400,000,000,000 stars! The authors of the article word science should be replaced with the word magic. pretty awesome to see where we likely got our start. A low mass progenitor and Type II supernova should leave a neutron star behind. Now that would be something to find. I agree, but finding a SN remnant of an SN that occurred more than 5Gyr ago is clearly impossible.